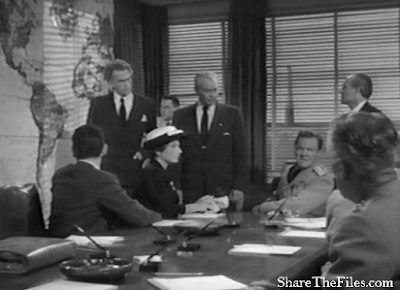 Five individuals from five nations suddenly find themselves aboard an alien spacecraft! Each person is given a container holding capsules! Only a mental command from the person to whom the container is given can open it! Each individual has now been provided with the power of life and death! The fate of the entire planet is in their hands! What will they do with the power they have been given? Five disparate individuals separated by geography, artificial boundaries and a combination of somewhat dissimilar cultures, languages, political and ideological belief systems and values, are about to be forcibly united in a shared purpose by forces beyond their control. Suddenly a voice announces, “People of earth, permit me to explain. “The voice belongs to a humanoid known only as "The Alien." This alien host explains to his human ‘guests’ that he is the representative of a world orbiting a sun in a “nearby universe” and that the sun is about to go nova. 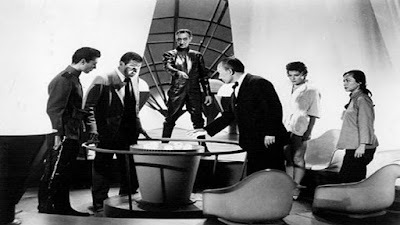 The alien informs the five humans that his race of beings need a new world to inhabit within the next 35 days, but that they are prohibited by their moral code from killing intelligent life. Each of the five people are provided with clear containers consisting of three capsules. 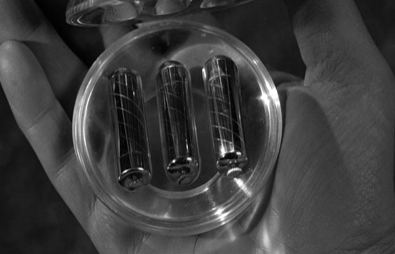 Each capsule is capable of destroying all human life within a 3,000-mile diameter. It is expected that humanity will wind up using all the capsules, thereby obliterating itself from the face of the Earth and leaving the way clear for alien colonization of the planet. Each container is “tuned to the electrical impulse of its owner.” In other words, it can only be opened by the thought waves of the person originally in possession of it. However, once the container is opened, the capsules can then be used by anyone, but only for the next 27 days, after which they become inactive. To keep the peace for 27 days. 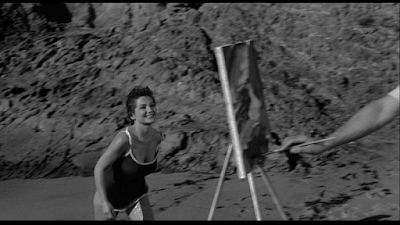 Back on Earth, Eve casts her capsules into the choppy waters of the English Channel. Her decision: To have nothing to do with such awesome power and responsibility. 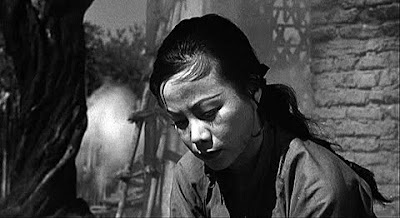 Meanwhile in China, amid the smouldering ruins of her home, Su Tan chooses to commit suicide before a statue of the Buddha, thereby causing her capsules to be destroyed. Her decision: To escape further suffering in this life by choosing what for a Buddhist would be, a negative act that will ultimately block the path to enlightenment. 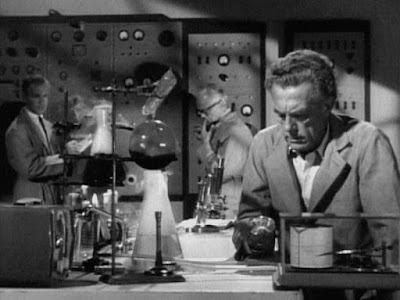 Professor Bechner succumbs to scientific curiosity and opens his container by using his own thought waves. His decision: Despite possible consequences, to gather data, test hypotheses and approach the problem rationally instead of reacting emotionally. 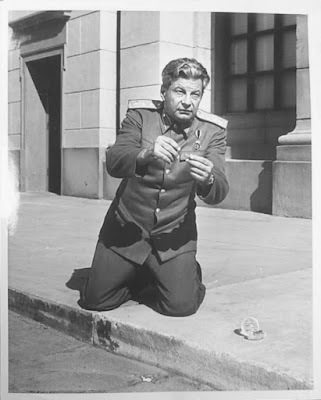 Back behind the Iron Curtain, Private Ivan Godofsky decides to conceal the truth from his political and military masters who he knows will make use of the capsules and any information about the alien to their own advantage. When questioned, he tells his comrades that he thought he saw something but was mistaken. 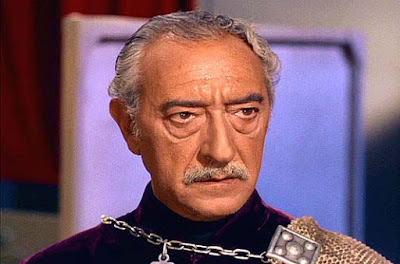 The system under which he lives encourages either mindless obedience or concealment of the truth and subterfuge. 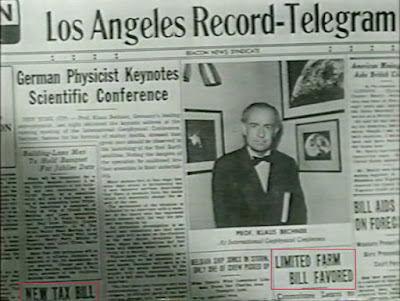 The next day, the Alien takes control of all electronic communications and informs the world that there is to be an “announcement of vital importance” that will contain “information of vital concern to the people of Earth.” The alien then reveals to the world the existence and nature of the capsules. 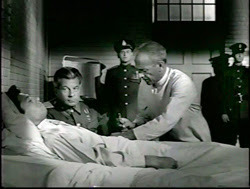 Meanwhile, just after hearing the broadcast while on a trip to the U. S., Professor Bechner is struck by a car while crossing the street and is taken to the hospital. 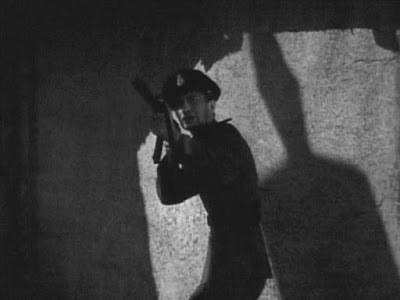 At about the same time in the USSR, Ivan Godofsky is pursued and detained by the authorities. “….As to the question: Was it real? The answer must be held to be, yes! …..The alien spoke from a point somewhere beyond and outside of the earth’s atmosphere…..
As a result of the growing panic and with the “whole town locked up,” Clark takes Eva to a closed race track where they can hide. 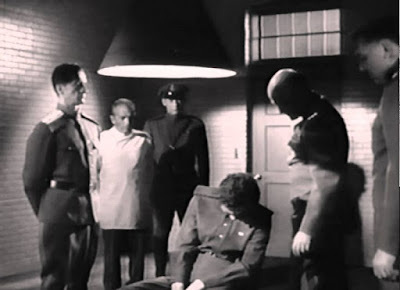 Suspecting that the box “contains a secret of great power” which he must obtain before the Americans do, the general orders Ivan to be subjected to interrogation in order for him to reveal the truth. Quite a recipe for growing sexual tension to develop between Eva and Jonathan! 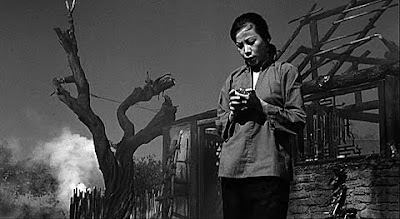 Eva, on the other hand, observes that “people hate because they fear and they fear what they don’t understand.” This is one of those eternal truths about people no matter what era they live in. It certainly goes some way towards explaining how people fleeing across national borders may be viewed or how people of certain racial, ethnic, religious or political groups, or even sexual orientation are often treated. 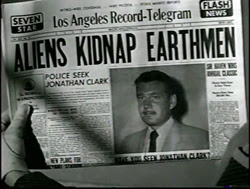 Meanwhile in the US panic continues to mount as a recuperating Bechner refuses to reveal the details of The Alien's plan. The withholding of information is leading to increased concern and apprehension. 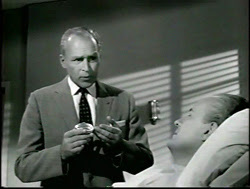 The professor does reveal that “the box and its contents cannot in themselves be harmful to anyone.” As with most technological developments, it is often the uses to which they are put and the intent behind their application that will determine the likelihood of their causing harm to people. 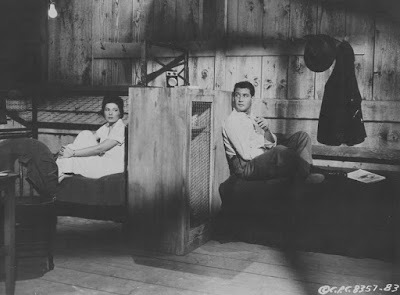 After two Communist agents almost succeed in assassinating Bechner, and an innocent man who resembles like Clark is killed by a mob, Clark becomes a lot more introspective and arrives at a crucial decision. 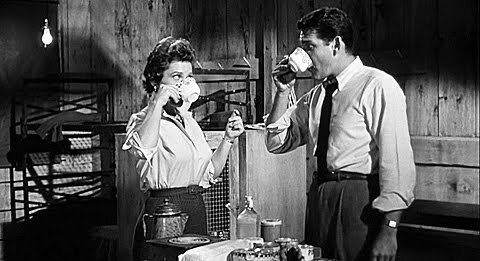 He declares to Eva, “maybe for the first time in my life I’m thinking of the next guy to do the right thing by him.” He and Eve then decide to voluntarily surrender themselves and be placed in government custody. 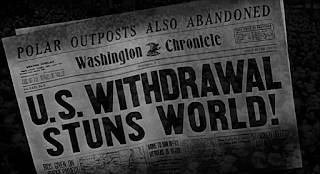 Clark’s decision: “Both nations have the ultimate weapon. I tried to stay out of it by hiding.” He is now involved. IRON CURTAIN BREAKS SECRET OF ALIEN BOX! It appears that the whole matter of humanity being faced with a crucial choice is really one that has been staring it in the face since the mid-20th century to the present day. Throughout that time, the human race has possessed the capacity to destroy itself but has lacked the will to choose (like Eva did) to completely and utterly do away with the means of doing so. 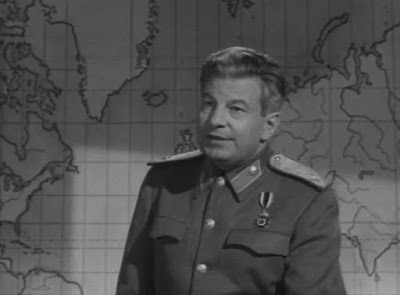 And so the next move in the game is made with the Soviet general declaring that he is “prepared to destroy all life on the North American continent” if the US does not withdraw from Europe and Asia and limit itself to the continental US. A first strike policy is settled upon as a course of action as it is believed that “democracies are appeasers” and that the US needs to be bombed into war if it is not provoked. Global anxiety increases, prompting Clark and Bechner to cooperate with U. S. authorities. 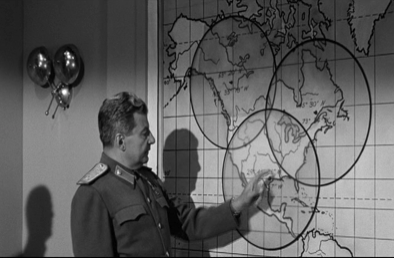 A decision is then made to test one of Bechner's capsules to determine the veracity of the Soviet threat and ultimatum. A dying professor “born in Germany but resides in Missouri” has exposed himself on purpose to a lethal dose of radiation and volunteers himself to be left on a raft in the middle of the ocean as part of a test of the capsules’ capabilities. For the volunteer it is a question of “one life against millions” After a capsule is opened, his exact coordinates are read out loud and he is instantly vaporised. The truth is now known. On board a U.S. destroyer Bechner begins to study the remaining capsules and considers that the whole matter is not just a question of ‘life or death’ but is instead a question of “life AND death.” He also discovers some kind of a message or imprinted code on the capsules. Over in the USSR the Soviet general prepares to use the capsules when suddenly Godofsky makes a dash for him causing the capsules to fall to the ground below the balcony on which the general was standing. Just then on the ship Bechner, safe from outside intervention in a cabin, launches all the remaining capsules. 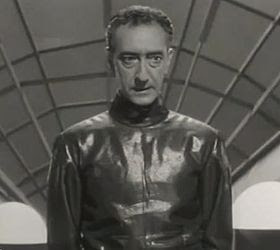 He had managed to discover that the capsules can be programmed in the sense that they can indeed bring life and death. 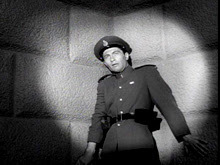 The resulting “invisible rays from outer space” and ultra-sonic wave kills all "confirmed enemies of freedom," including of course the Soviet general! In this scenario mankind has been judged and found not to be wanting. Should the gods set us a similar test in this, the second decade of the 21st Century, how would we fare? 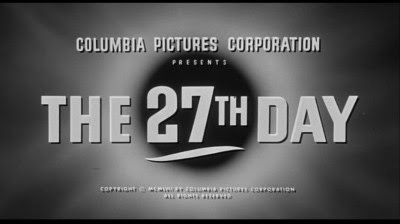 The 27th Day is based on the successful first novel by Canadian-born writer John Mantley. The novel was chosen as a Book-of-the-Month Club selection. 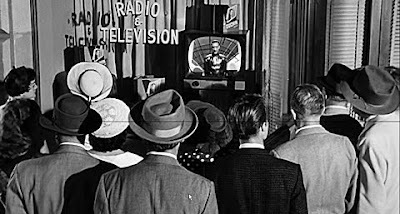 We have seen the film’s leading man, Gene Barry in another science fiction film that was earlier featured in this vlog, George Pal's classic 1953 film The War of the Worlds. 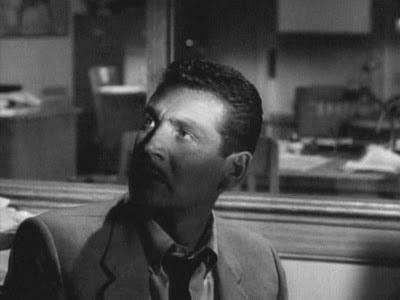 Another face we are familiar with belongs to actor Paul Birch, who had roles in sci-fi cult favourites such as The Beast with a Million Eyes (1955), Day the World Ended (1955), and Not of This Earth (1957), all of which have been featured in this blog. 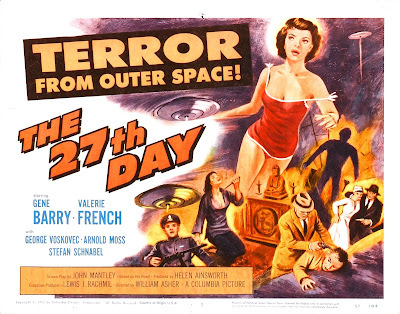 The 27th Day is certainly a film of its time that played on the rising interest in science fiction and unidentified flying objects, as well as on the fears of people during the Cold War period. But it also held up a mirror to those times and forced people to think about the danger and folly associated with the Cold War. 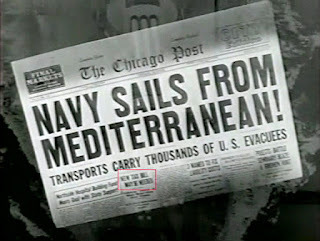 Its relevance 60 years later? North Korea…. South China Sea…. Iraq…. Religious fundamentalism…. Syria…. Refugee crisis…. South Sudan….US racial tensions…. Russia & NATO…. a nine member nuclear weapons club……. Brexit…. Trump! It seems that humanity still has a long way to go until it can rise beyond its destructive, infantile and petty conflicts and not succumb so easily to fear.